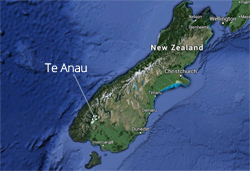 It is easy to get around Te Anau and Manapouri on foot or bicycle; our towns are built on the flat, with little traffic, and most homes and accommodation are within walking distance or easy cycling distance of the shops and restaurants. Te Anau is a very straightforward town, with one long main street, where nearly all the shops are located, and ending at our beautiful lake front. The street starts from a T junction with the main road coming in to town and the Milford Road. Hotels, motels, bed and breakfasts, residents' homes, and holiday homes radiate out on both sides of the main street. If you are bringing a car into town, the Fiordland Event Centre (on the left as you come into town from the Mossburn direction) provides plenty of free parking, and from there it's a very short walk past the skate park to the main street. Parking here helps keep our main street traffic-free, and a more pleasurable place for shoppers and cyclists. However, if you have mobility problems or need to lift heavy shopping you can also park outside shops in the main street. If you want to get from one end of town to the other, the best way to do it is to stroll along our fabulous lake front, gazing at the largest body of freshwater in Australasia; a photographer's dream. There is a beautiful lakefront walkway, with benches along the way. It's also the perfect place to sit with a takeaway coffee, or perhaps one of our world-famous pies. If you want to travel a little further afield, you can also walk south around the lake to the entrance to Fiordland National Park. It takes about an hour but it's worth it. Along the way you walk through the free-entry Wildlife Park and get a chance to see our incredibly rare Takahe birds (put a donation in a donation box however). To get to Manapouri, the neighbouring village of Te Anau, you drive south on the Manapouri Highway, with stunning views of Mount Titiroa. Manapouri is a small village built on an amazing lake front and also bordering the Waiau River, although some Manapouri accommodation is out of the village in rural locations, some distance away. You can stroll the lake front using the Frasers Beach track. If you have a car, please help the community be sustainable, healthy and happy, and most of all safer for our children, by walking or cycling when you can around our towns rather than driving. When in Te Anau, it's a great idea to use the Event Centre car park if you have a car (see above) or leave it at your accommodation or holiday home or house. If you need to rent a bike, get yourself to Fiordland Bike Hire, located at the Mini Golf Course on Mokonui street, just off the main street, and just one street back from the lake front. This fantastic facility rents a variety of fun bikes, including an bike that seats multiple people in a circle! You can also rent bikes from Outside Sports, a shop close by, on the other side of the main street. If you have just arrived in Te Anau, or you are spending a day in Te Anau, then never fear; we have some great public toilets! There are free toilets at the back of Kiwi Country, a tourist gift shop half way down the main street. There are also some beautiful toilets next to Lions Park on the lake front, although there is a fee to use these toilets. You can also grab a shower here; a good option if you have just been camping in a national park campsite and need to clean up!